In times that have challenged contemporary illusions, many seek to recover the Christian vocabulary of suffering, the cross, and a hope freed of triumphalism and exclusivity. 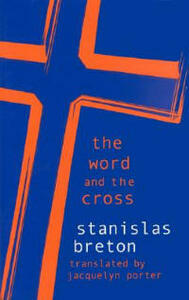 Stanislas Breton presents the "nothingness" of the cross in its infirmity and paradoxical power. Blending the poetic with the philosophical, faith with interrogation, mystical and practical, ancient and new, he seeks to lift the cross from its imprisonment in ontologies of abundance and in a history of compromise. The Word and the Cross distills the meditation of a thinker in his prime on the possibility of the Christian and Christianity to find within a principle of a critique and source of renewal. Breton draws first upon Scripture, examining the way in which the cross has been present in our world, beginning with Paul's preaching of it as Logos, folly (moria), and power (dunamis). In a startlingly original interpretation, Breton first interrogates the emergence of the cross as Sign of Contradiction in the world of Greek and Jew and then traces its destiny in politics, in theology and in the poignant theater of "the fools of Christ." Enriching scriptural exegesis with allusions to neoplatonism, Sufi mysticism, and diverse theologies, Breton offers a more profound understanding of kenosis that privileges the language of service and engagement. Passing beyond philosophies of dissonance and even the via negativa, he argues for a commitment to evangelical justice and human community that demands of the Christian and Christianity, as of all systems and religions, an inner principle of renewal and self-critique. The cross, as a Sign of Contradiction, functions as such a principle. Breton presents it on many levels: spiritual, philosophic, linguistic and poetic. With modesty and power, he focuses upon this "mark of interrogation," preparing the way of the Word in our world. The Word and the Cross is the first translation in the United States of this major contemporary French thinker, introducing rich resources for further exploration.